You can fly to Europe this fall for half the miles with the newest Flying Blue Promo Awards from KLM and Air France. These are now updated monthly instead of every couple of months. If you don’t have Flying Blue miles, you can transfer points from American Express Membership Rewards or Starwood points. Even if you don’t live near Chicago, Houston, or Washington, DC, you might still be able to use these awards. That’s because there are lots of ways to get to these cities cheaply. I’ll explain! The fees and fuel surcharges vary depending on the route. KLM and Air France fly to Paris and Amsterdam from the US, but you can connect onwards to other European destinations for the same price. Flying Blue’s definition of Europe includes destinations in North Africa, the Middle East, and near Asia. For example, Israel, Tunisia, and Western Russia are included in the sale. Although KLM and Air France are part of the SkyTeam Alliance, you have to use Flying Blue miles (not miles from another SkyTeam airline, like Delta or Korean Air) to book your ticket. If you book an award ticket, you can cancel it without penalty within 24 hours of purchase. 12,500 miles for a 1-way ticket to Europe from the US sounds like a great deal, but you will pay fuel surcharges which vary depending on route. You’ll have to do the math to decide if this is a good deal for you. You can fly from Houston to Amsterdam for 12,500 miles and ~$90 (slightly more if you connect through Paris). There are award seats available every day in October! November is very similar with award seats available almost every day. 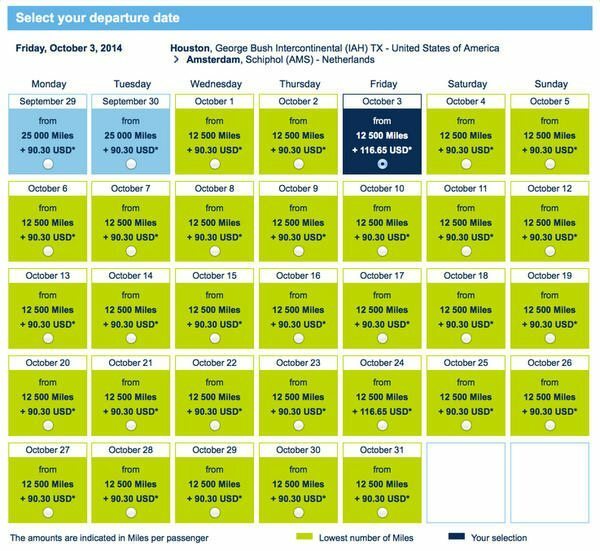 Returning from Amsterdam to Houston in October, you’ll pay 12,500 miles and ~$143. 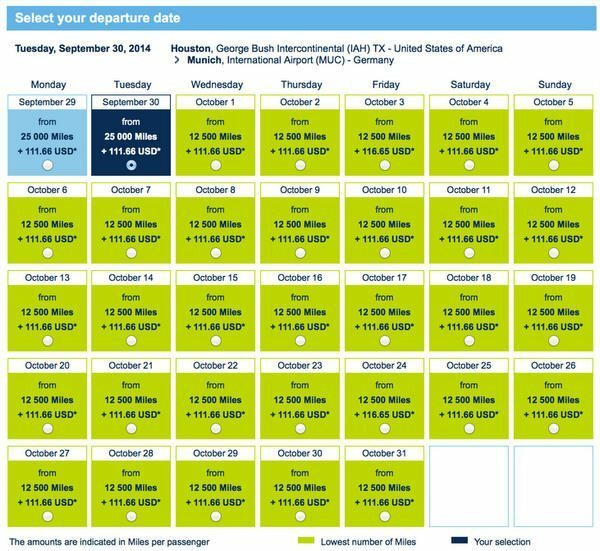 There are still award seats available, but not as many as going from Houston to Amsterdam. 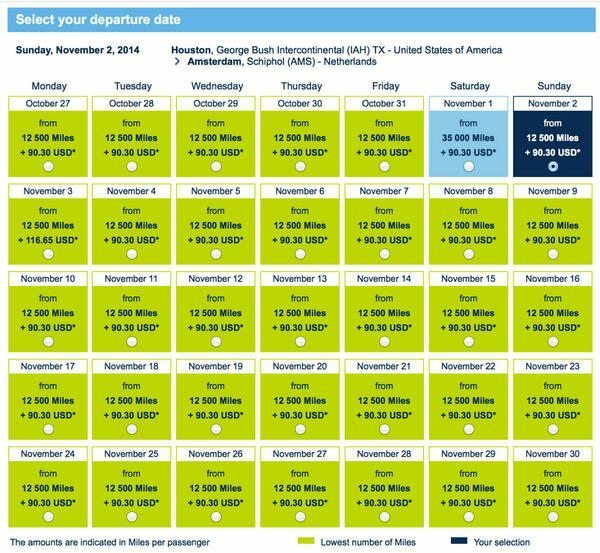 And here’s the calendar of available award seats from Amsterdam to Houston in November. There are award seats available almost every day. So for a round-trip award ticket between Houston and Amsterdam, you’ll pay a total of 25,000 miles and ~$233 in taxes and fees. That seems like a lot of cash, but consider that a paid KLM coach class ticket in October for the same route costs ~$1,226. So this could be a good deal for some folks! It costs 12,500 miles and ~$90 to fly from Washington, DC to Paris on Air France. Every day in October has award seats available. 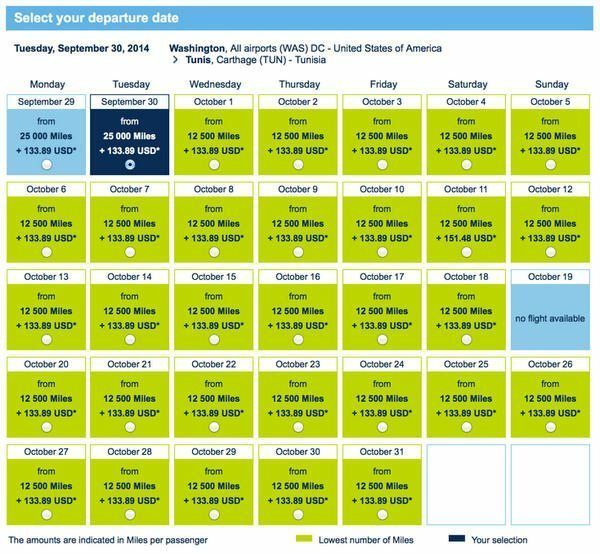 Here’s the calendar of available award seats for the same route in November. 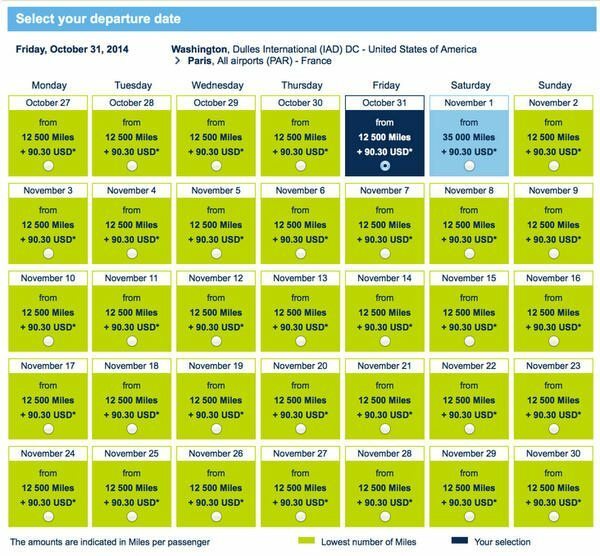 Returning from Paris to Washington, DC, you’ll pay 12,500 miles and ~$169 (slightly more for some routings). Almost every day in October has available award seats. Here’s the award seat calendar for November. So a round-trip ticket between Washington, DC, and Paris costs 50,000 miles and ~$259. To compare, a paid Air France coach class ticket for the same route costs ~$1,209. I think I’d rather pay ~$259 and 25,000 points than ~$1,209 for a paid ticket. To fly from Chicago to Amsterdam, it costs 12,500 miles and ~$90. There aren’t as many award seats, but there are still a good number of dates available. 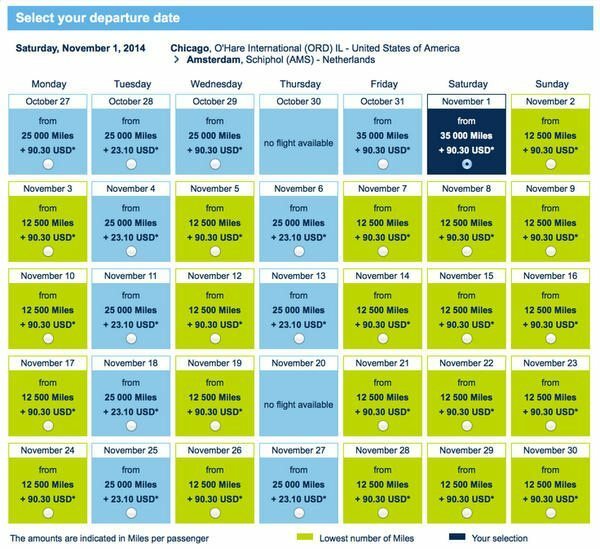 Note: For this route, Flying Blue Promo Awards are only available for November, not October. Returning from Amsterdam, it costs 12,500 miles and ~$143. There are a similar number of award seats available. 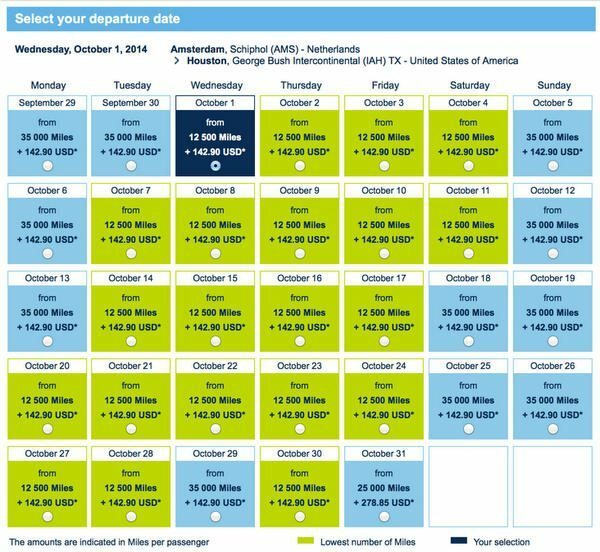 In total, you’ll pay 25,000 miles and ~$223 for a round-trip ticket between Chicago and Amsterdam. This is still cheap compared to buying a paid ticket, which costs ~$1,050. My favorite thing about this deal is that you don’t have to end your trip in Paris or Amsterdam (the destinations served by Air France and KLM from Houston, Chicago, and Washington, DC). You can connect onward to other cities in Europe, near Asia, Africa, and the Middle East for the same number of miles! 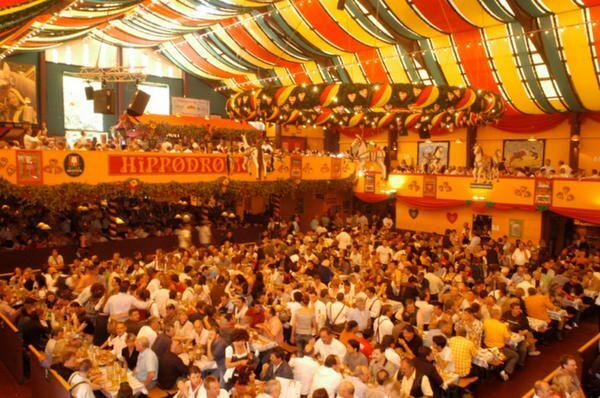 You could catch the last week of Oktoberfest in Munich, Germany for 12,500 miles and ~$112 1-way. There are plenty of award seats available! 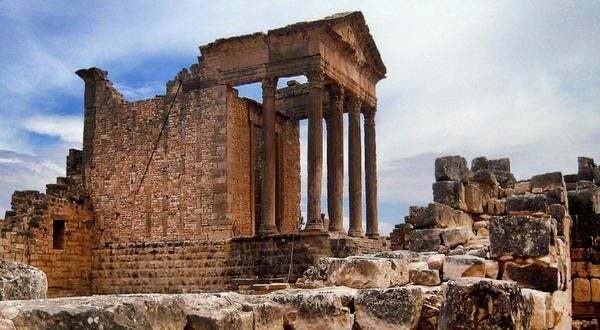 Or how about an exotic vacation to visit ancient Roman ruins (and great beaches) in Tunisia? You’ll pay 12,500 miles 1-way plus ~$134. There are lots of available award seats! 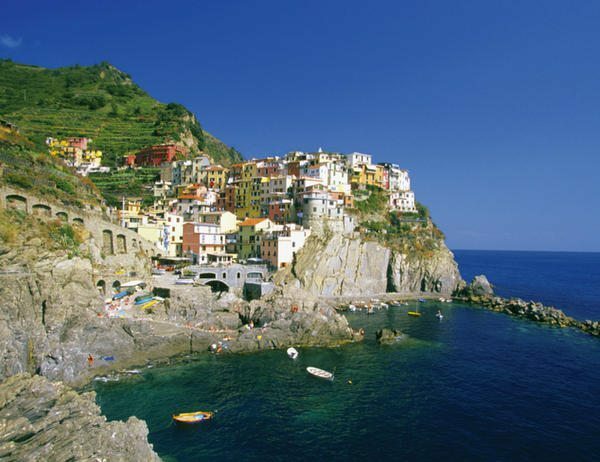 This is a great opportunity to visit some very interesting destinations for very few miles. What If You’re Not in Houston, Chicago, or Washington, DC? If you’re not near 1 of the cities included in the sale, you could cheaply use points (like British Airways Avios) to get there. British Airways Avios points are great for short-haul flights on American Airlines, because you only pay 4,500 points 1-way for flights less than 649 miles, and 7,500 points for flights up to 1,149 miles. And there are no fuel surcharges. Or if you have the Southwest Companion Pass, you could get to these cities very cheaply. That’s because with the Companion Pass, your companion flies with you for almost free on both paid and award tickets. Note: If you want to fly out of Houston, Southwest flies into Houston Hobby Airport (HOU) while KLM and Air France fly out of Houston George Bush Intercontinental Airport (IAH). So you’d have to change airports if you fly in on Southwest. And if you’re flying out of Chicago, note that Air France and KLM fly out of Chicago O’Hare airport (ORD) but Southwest flies out of Chicago Midway (MDW). So you’d have to change airports there, too. Worst case, you could try to find a cheap paid ticket from your home airport to Houston, Chicago, or Washington, DC. Definitely do the math to see if it’s worth it. 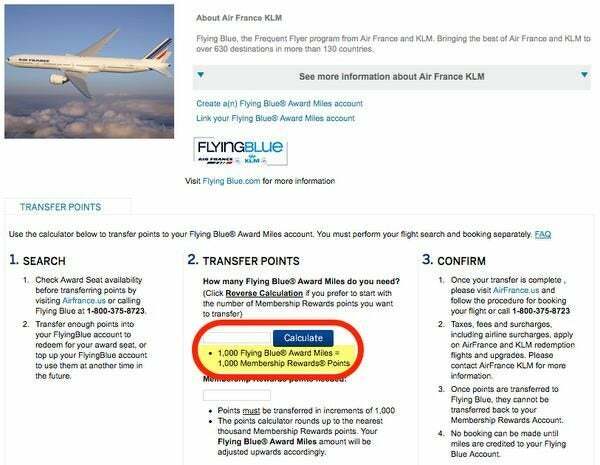 You’ll need Flying Blue miles to book Flying Blue Promo Awards, because you can’t use miles from other SkyTeam airlines (like Delta). But if you have certain American Express cards, they’re easy to get. You could transfer points from the American Express Starwood Preferred Guest card to Flying Blue in a 1:1 ratio. And remember, if you transfer 20,000 points, you’ll get a 5,000 point bonus for a total of 25,000 Flying Blue miles. So you’re really only spending 20,000 Starwood points plus fees for a round-trip coach class ticket to Europe. That’s a really good deal! Note: Starwood points can take up to 4 weeks to transfer, although in my experience it’s taken from 2 to 12 days. So if you plan on booking, keep in mind your exact award ticket might disappear while waiting for the points to transfer! 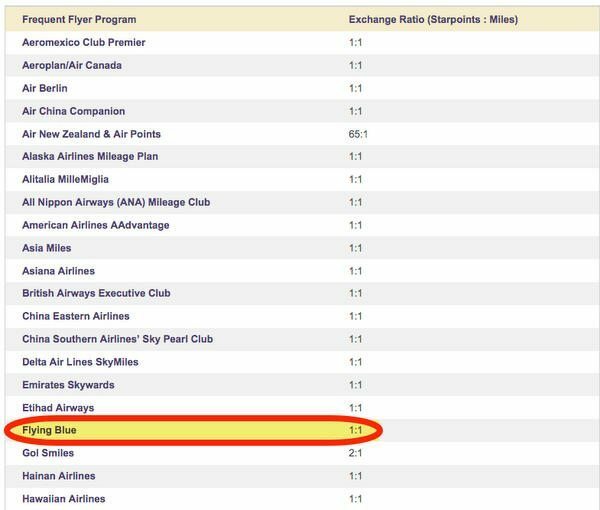 Or, if you have an American Express card that earns AMEX Membership Rewards points, like the American Express Platinum, American Express Mercedes-Benz Platinum, American Express Premier Rewards Gold, or American Express EveryDay card, you can transfer your points to Flying Blue miles at a 1:1 ratio. Note: You won’t get an extra 5,000 miles on the transfer like you would with the Starwood Preferred Guest card. However, there have been transfer bonus promotions in the past between AMEX Membership Rewards and Flying Blue. With Flying Blue Promo Awards, you can fly to Europe and beyond on KLM and Air France for only 12,500 miles 1-way this October and November. This time, the US destinations included in the sale are Chicago, Houston, and Washington, DC. You must book by August 31, 2014, and travel between October 1, 2014, and November 30, 2014 (except for Chicago flights, which are only valid for travel in November 2014). 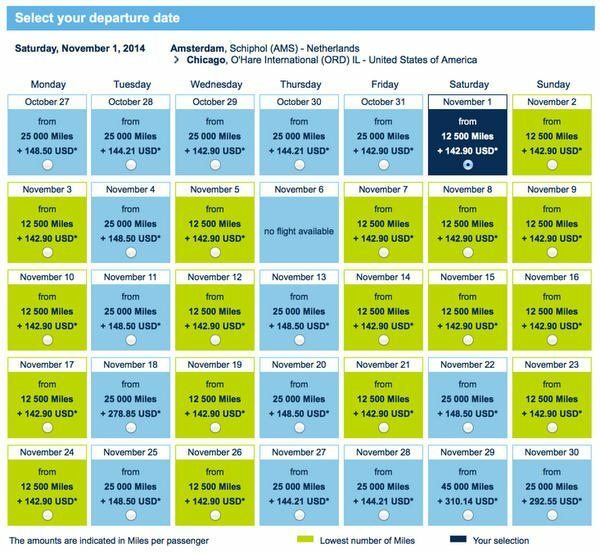 Only award tickets booked directly through Air France or KLM using Flying Blue miles are eligible for the deal. You will pay taxes and fees for award tickets, which can be pricey. But it could be worth it for some folks, because you’re saving so many miles. And most routes have a good number of award seats available. And with this promotion, you can connect to North Africa, the Middle East and near Asia for the same number of miles. Both Starwood Preferred Guest points and American Express Membership Rewards points transfer to Flying Blue at a 1:1 ratio. And you’ll get a bonus 5,000 miles if you transfer 20,000 Starwood Preferred Guest points, which makes the deal even better! Have you thought about taking a trip later this fall with Flying Blue Promo Awards? SPG points transferred! 5 total days, 3 of which were business days. Definitely better than waiting the potential 4 weeks. Off to Europe! Also, can I book for someone else using my miles in addition to myself? @Z – Yes, you can book for someone else! Using this deal, can I have a 3 day stop over in Paris/Amsterdam and then head to Munich for the same price? I tried to input Amann Jordan from the US, but couldn’t get that to work. Surely that works in the deal, right? @Dan’s the Man, I saw that too. Though right now might not be the best time to go to Israel, too bad because it’s a great value. Daraius thanks for the heads up. My October was a little light on travel and I was looking for something to add. I’m transferring the SPG points over now, hopefully it will be quick and leave me lots of award seats.